Meditation can wipe away the day's stress, bringing with it inner peace. If stress has you anxious, tense, and worried, consider trying meditation. Spending even a few minutes in meditation can restore your calm and inner peace. Anyone can practice meditation. It's simple and inexpensive, and it doesn't require any special equipment. And you can practice meditation wherever you are whether you're out for a walk, riding the bus, waiting at the doctor's office or even in the middle of a difficult business meeting. Practiced for thousands of years, meditation originally was meant to help deepen understanding of the sacred and mystical forces of life. 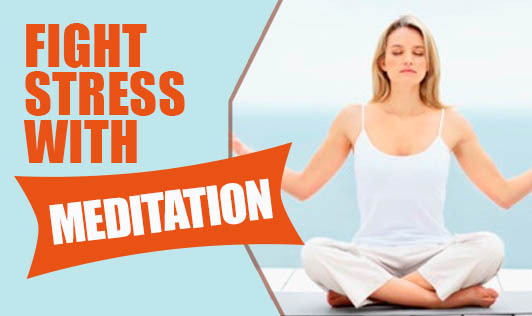 These days, meditation is commonly used for relaxation and stress reduction. Considered as a type of mind-body complementary medicine, meditation produces a deep state of relaxation and a tranquil mind. During meditation, you focus your attention and eliminate the stream of jumbled thoughts that may be crowding your mind and causing stress. This process results in enhanced physical and emotional well-being. Meditation can give you a sense of calm, peace, and balance that benefits both your emotional well-being and your overall health. And these benefits don't end when your meditation session ends. Meditation can help carry you more calmly through your day and can even improve health. Here are a few ways to meditate. Choose one that suits you. Sometimes called guided imagery or visualization, with this method of meditation you form mental images of places or situations you find relaxing. You try to use as many senses as possible, such as smells, sights, sounds, and textures. You may be led through this process by a guide or teacher. This type of meditation is based on being mindful, or having an increased awareness and acceptance of living in the present moment. You broaden your conscious awareness. You focus on what you experience during meditation, such as the flow of your breath. You can observe your thoughts and emotions but let them pass without judgment. This practice generally combines meditation, relaxation, physical movement, and breathing exercises to restore and maintain balance. Qi gong (CHEE-gung) is part of traditional Chinese medicine. You use a mantra, such as a word, sound or phrase repeatedly silently, to narrow your conscious awareness and eliminate all thoughts from your mind. You focus exclusively on your mantra to achieve a state of perfect stillness and consciousness.